There’s a certain thrill when guests come to visit. They’ve made time in their busy schedule to visit you, spent time travelling, and want to create some precious memories. One easy way to give back to them is to prepare the perfect guest bathroom for them. Who doesn’t love being wrapped up in a warm, fuzzy towel after a hot shower? Show your guests that you want them to be cozy, even if it isn’t their own home. While good quality towels can be quite expensive, investing in them for guests is a good idea. If you keep them just for guests, they will be used less frequently, and as such, will have a longer life span. Purchase white or neutral colors, in case you want to change the color scheme along the way. In addition to large size towels, stock up on hand towels and face cloths. Have a stack readily available in your guest bathroom. If there is no linen closet in there, purchase a shelf or bin to place the towels. Alternately, you can leave out a stack of towels in the guest room. Being prepared for your guests means they don’t have to worry about bothering you for extra towels. Who hasn’t travelled somewhere, only to realize they forgot their toothbrush? Have a few new toothbrushes handy for this eventuality. The same goes for toothpaste and floss. You can choose to buy sample size products, or larger, multi-use items that live in the bathroom. Put a little basket on the counter with a note saying, “Help Yourself!” so that guests know they can use the items. It’s a small gesture that will go a long way in accommodating their needs. The same goes for other items such as shampoo and conditioner. While you can buy smaller size bottles, for these items, simply place them in the shower or bath area of your guest bathroom. Just be sure to periodically check on their contents and replace as needed. When packing for a trip, one item that women continually worry about is the hair dryer. While this is usually an essential part of the daily routine, hair dryers can take up a lot of precious space in a suitcase, especially if you’re trying to pack for carry-on luggage only. In your guest bathroom, place a hair dryer in the vanity cupboard. And let your guests know of its existence. This way guests can style their hair without having to weigh down their suitcase. 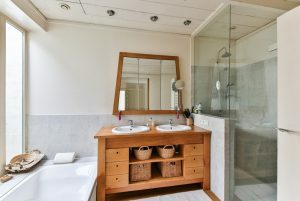 Typically, a guest bathroom will be a smaller space. It also might not be used as often. But try not to forget about it. A few nice touches can go a long way. Whether it’s a quality vanity counter or a chrome faucet, the more luxurious you can make the room feel, the happier your guests will feel. Knowing that they are a part of your home will inspire them to come back and visit often.